Tennessee quarterback Jarrett Guarantano hands off during the Vols' game at Georgia on Sept. 29. KNOXVILLE — Patchwork as it may be, Tennessee still has to put an offensive line on the football field each week. Through nine games this season for the Volunteers, it has been more about taking the bad with the good, as opposed to taking the good with the bad. The unit took a step back last Saturday in an underwhelming 14-3 win against Charlotte on homecoming, when the Vols rushed for 20 yards against their Conference USA visitors, fewer than they had against heavyweights Alabama (31) or Georgia (66). Eight players appeared on the offensive line for the Vols against Charlotte, but the tinkering with the group has been going on all year. It started in early September when Brandon Kennedy, a graduate transfer from Alabama, was lost for the season, which stripped the line of its expected starting center. Compounding that was the indefinite loss two weeks ago of sophomore left tackle Trey Smith, a preseason All-Southeastern Conference selection who has been diagnosed with blood clots in his lungs for the second time this year. Not many teams could handle the loss of two quality offensive linemen. For a young and rebuilding Tennessee team, it's been nearly catastrophic, with first-year head coach Jeremy Pruitt deprived of a chance to see the offensive line as its full potential. While the Vols haven't had the rushing success they would like, ranking last in the SEC and 110th among Football Bowl Subdivision programs, don't expect them to move to a pass-happy attack anytime soon. "It's hard to win in this league if you can't run the football," Pruitt said Monday. "We've got to be committed to it and we've got to find a way to get it done. As a defensive coach, when you're coaching the D-line and (an opponent is) going to pass it every snap, those guys can turn loose and go and put the offensive line at a disadvantage, so we've got to be able to run the football." In a 27-24 loss at South Carolina on Oct. 27, the Vols generated 144 yards on the ground, their second-best rushing performance against a Power Five conference opponent this season. Against Charlotte, without the 49ers' two sacks factored in, Tennessee ran for 40 yards on 26 carries. Charlotte currently boasts the No. 3 rushing defense in the country, but the 49ers hadn't faced a team from a Power Five conference this season until last week's visit to Knoxville. "I think it was execution," Pruitt said during Wednesday's SEC coaches teleconference. "We had very few mental errors against South Carolina. We went to the right folks and gave ourselves a chance. Against Charlotte, we had several mental errors, and when you leave guys unblocked at the point of attack, it's hard to get the run game going." Life won't be any easier this week. No. 12 Kentucky (7-2, 5-2) ranks fifth in the conference against the run, but last week the Wildcats allowed a season-high 331 rushing yards in their 34-17 loss to Georgia with the SEC East title on the line. That's more than twice the previous season high for an opponent's rushing offense. Offensive success for the Vols (4-5, 1-4) against Kentucky could be predicated on how well they create some semblance of a rushing attack. That means the offensive line will have to do its job of creating gaps, which in turn might lead to play-action passing opportunities that could get the ball to receivers Marquez Callaway (30 catches for 402 yards this season) Jauan Jennings (26 for 335) and Josh Palmer (18 for 414) or tight end Dominick Wood-Anderson (10 for 108). "They're trying to find the right pieces to put the players in position to be successful," Kentucky coach Mark Stoops said during Wednesday's SEC coaches teleconference. 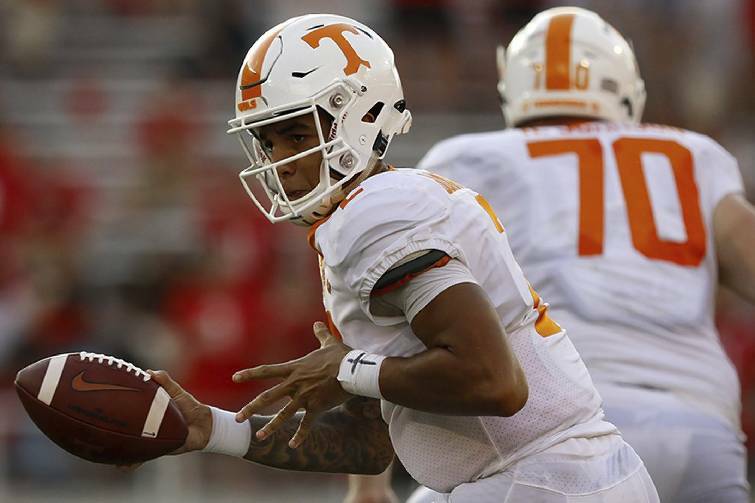 "They have some dynamic receivers that are getting better, and Jarrett (Guarantano) is getting much better with the opportunities he has at quarterback. They're getting better and better; they've been slowed by some injuries, but they're trying to find the right pieces offensively." Pruitt said Wednesday that if the Vols were unable to reach six wins but were still invited to a bowl, Tennessee would "absolutely" be interested. If the NCAA is unable to fill out the bowl schedule with teams that have won at least six games, it will turn to teams with a 5-7 record. Last season, 15 bowl teams had nonwinning (6-6) records, and no team with a losing record had to be invited for just the second time in seven years. "We'd love to play as many games as we could," Pruitt said. "In the spring, I wish we had 45 practices instead of 15. We need all the practice we can get."